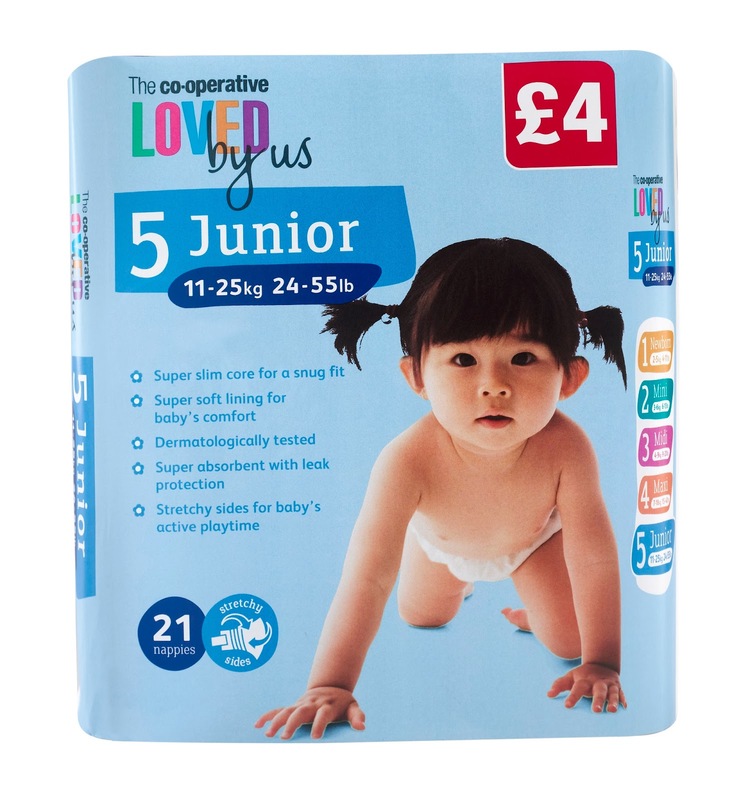 The Co-operative very kindly sent us some nappies to review recently. We received a pack of Maxi and a pack of Junior sized to try out. Firstly, please let me add an apology for the stock photos and none of E modelling them(!). She has suddenly become rather camera aware and was too quick for me to snap away! The nappies are part of the "Loved by us" range providing busy families with great value, quality products. Prices start from £2.75 a pack and cater for different stages of a baby's development - birth to early years. They feature a specially-designed core to ensure a snug fit along with a soft lining for comfort. There was no chemical smell that I have noticed with some brands of nappies and a cute pattern on the front. I was very surprised at just how lightweight and thin they felt. My initial thoughts were that they felt too thin and wouldn't be absorbent enough. The fastenings were secure and easy to undo and refasten. I didn't have any problems with them ripping as I have with other brands. E seemed to find them comfortable - there was no itching or marks left from the fastenings, around the legs or the back of the nappy. We had a mixed experience using both sizes of the nappies. She wore them for a few nights, for 12 hours, with no leakages. However there were two occasions during the day when we did have leakages, one of which was after only 2 hours of wearing. This may have been because she was more active/had drunk more but it was hard to tell. Overall I would recommend them. Would we use them again? If we were near a Co-op store and we were running short of nappies, yes. However, the two stores nearest me are 10 and 15 miles away and so I wouldn't make a special trip to purchase. For further information on The Co-operative's product range, current deals and local stores, visit their website. Just to be clear: I was sent two packets of nappies to review. All words and opinions are my own. These nappies seem to stink when they are used. Not the normal dirty nappy smell at all - horrid and sulphuric!